Earlier this week we posted an overview of some of the many ways that companies and organizations are using holiday- and seasonal-themes to engage their fans on Facebook. Today, we're profiling Target's strategic Facebook efforts in-depth. The social media team at Target does a creative job leveraging holidays and contests as part of their web marketing strategy. 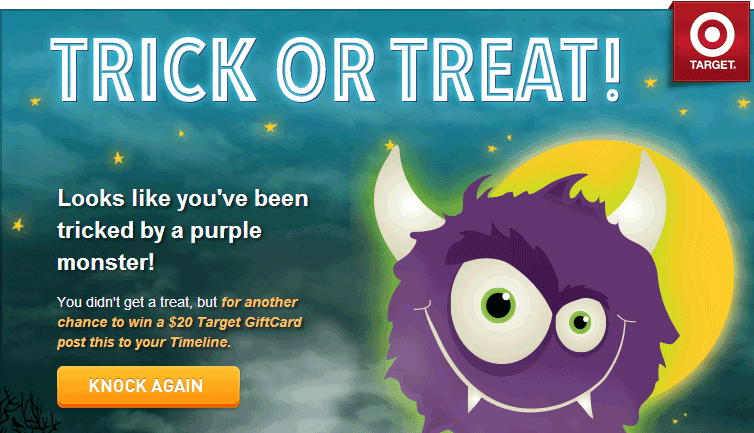 Target's recent incorporation of Halloween into its social media plans is inspiring. 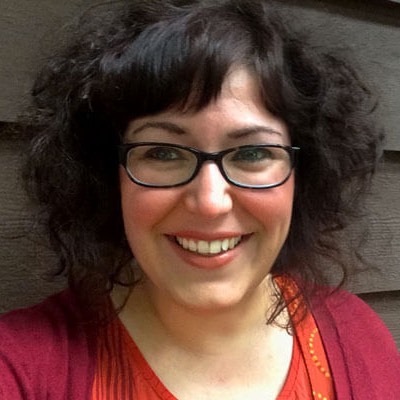 Their efforts will give you actionable ideas on what works when it comes to building and strengthening new, existing, and potential customer relationships using social media. 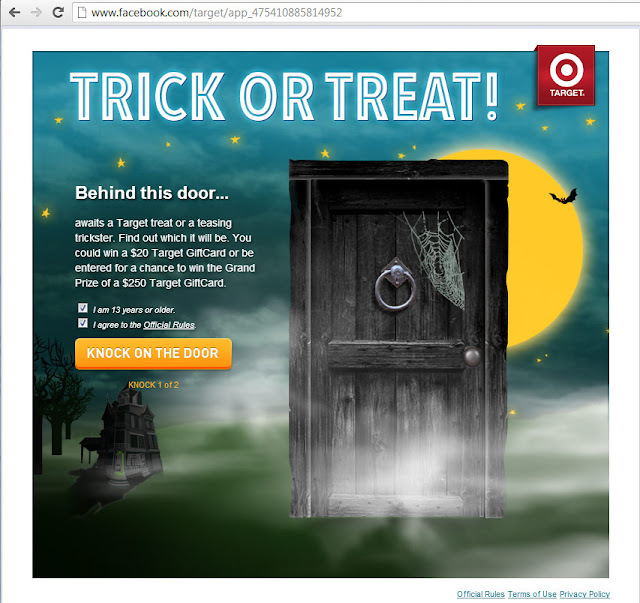 Here's a detailed look at Target's Halloween marketing campaign on Facebook. Target made the upcoming holiday prominent on their Facebook page in multiple ways, including on-topic status posts, a custom cover photo, and a holiday-themed interactive contest. 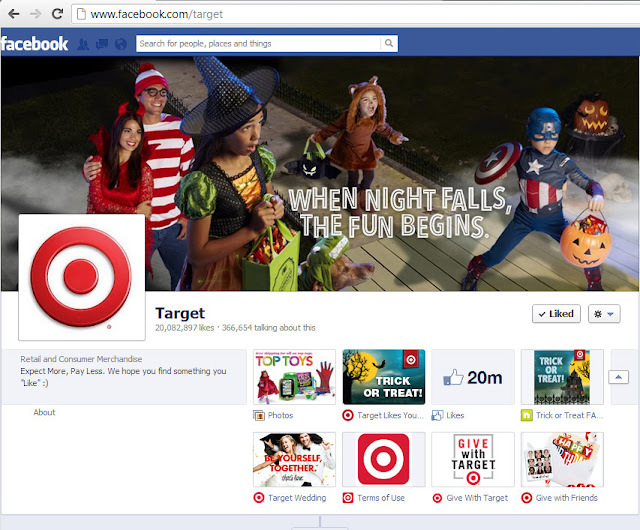 Target uses playful photography to showcase their Halloween costumes and other products prominently in their Facebook cover photo. 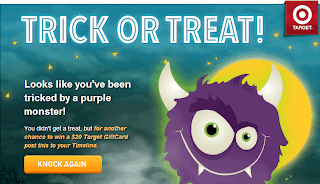 Their custom tab graphics also use Halloween-inspired graphics. All of the artwork and photographs compliment branding and marketing efforts done in Target stores, print ads and circulars, and even on television commercials and web spots. 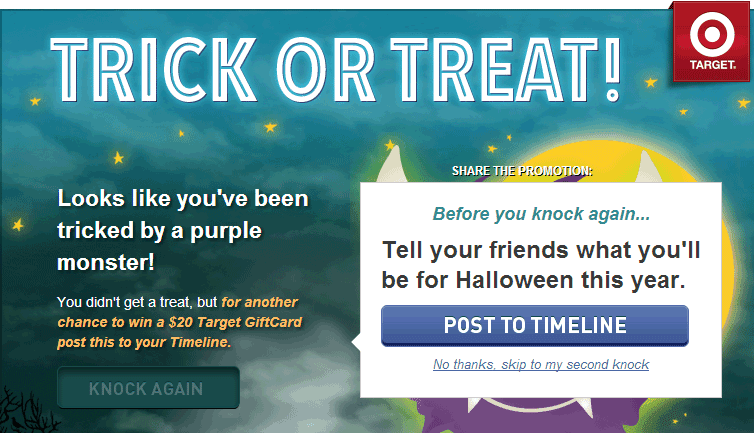 In addition to customizing their cover photo, Target is engaging their Facebook fan base through an interactive Halloween promotion called "Trick or Treat." The promotion gives customers a chance to win a $20 GiftCard or the grand prize of $250 GiftCard. Users are given two chances to win in the promotion. The first entry is "free," and the price of a second entry is where Target leverages the power of their fans' Facebook networks. Users can only earn a second entry by agreeing to help Target promote this contest. Specifically, the entry is earned by allowing Target to post about the contest to your timeline. Knowing that not everyone would want their friends to know they've entered the contest, Target has made this notification optional. Giving users the power to decide what they share makes this a thoughtfully executed marketing technique. Because the application doesn't force users to post a notice of participation to their timelines, Target keeps users trust because they're not forcing them to do anything they don't want to do in terms of viral promotion. The contest entry ends with a playful and encouraging nudge to come back and try again tomorrow. It is plays on a fun holiday theme that already might be on the minds of their fans. It offers their fans an incentive to visit their page. It is easy for their fans to participate. It encourages their fans to promote Target and their contest to their friends. It reminds their fans to come back to their Facebook page and try again. Call us if you'd like to discuss how to incorporate the holidays into your social media presence. Thanksgiving and the holidays are right around the corner. We offer social media strategy and custom Facebook pages. Let's get started!